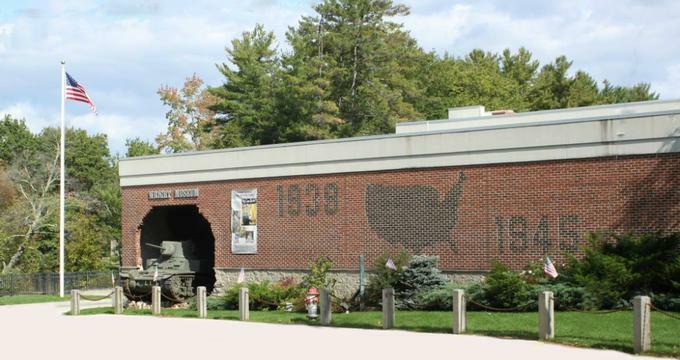 The collection of items at the Wright Museum of WWII in New Hampshire are dedicated to the Americans who were involved in one of human history's most tragic events. American society had never before been so completely invested in a common purpose. Airmen, sailors, and soldiers fought on battlefronts throughout the world. Back on the home front, almost every man, woman, and child helped to support war efforts through factory war production, war bond drives, volunteering, rationing, and many other ways. The mission of the Wright Museum of WWII is to share and preserve the stories of these people for generations to come. Dozens of fully-operational military vehicles can be seen along with many exhibits that tell what it was like for Americans on the battlefront across the museum's thousands of square feet. Visitors will also find extensive displays representing the radical changes that made their way through American society during the war. Several different exhibit galleries are located throughout the Wright Museum of WWII. A great way for visitors to start their exploration of the museum is a stop in the Orientation Theater. In the theater, visitors can watch a short video about the museum. The Time Tunnel offers guests a chance to walk through time as they explore the year 1939-1945. The mood of the country, news of the war, and pop culture are all captured in video and audio stations, as well as reminiscent displays. The Soda Fountain Exhibit recreates a significant social hub during the 1940's, while the Art Gallery hosts traveling exhibits and selections of WWII-era artwork and posters. The Military Gallery is a rotating exhibit that features the museum's collection of jeeps, tanks, motorcycles, and half-tracks, as well as weaponry and uniforms. Visitors can get a birds-eye view of the museum's vehicle collection from the Military Gallery Mezzanine, along with Air Force, Marine Corp, Army, and Navy displays. In addition to the military displays at the Wright Museum of WWII, there are several displays showing what it was like back. The Home Front Gallery showcases furnishings, ephemera, posters, toys and other everyday items that illustrate how Americans worked and lived during the war. The Wright Museum of WWII has added two spectacular features to improve the interactive experience for visitors. New SoundStiks in the Home Front Gallery offers visitors the opportunity to hear WWII-era sounds without disturbing other people around them. Visitors will also find new Ideum touchscreen in the Military Gallery. The touchscreen allows the museum to display multiple "virtual exhibits," of which the screen currently hosts two. The first "virtual exhibit" displays the museum's entire collection of vehicles, digitized. Visitors can use the touchscreen to see and learn more about the vehicles not currently on display in the gallery. The second one give guests a chance to read through digitized pages of a journal belonging to a prisoner of war (POW) from the museum collection. The exhibit shares the story of S/Sgt. Bursiel, a B-17 ball turret gunner, and what happened after his plane crashed in the Netherlands during World War II.